Cambodian Prime Minister Hun Sen rejected forged documents concerning the Royal Government reduced ministries to 16, speaking in an exclusive interview with Fresh News CEO Lim Chea Vutha on Monday. 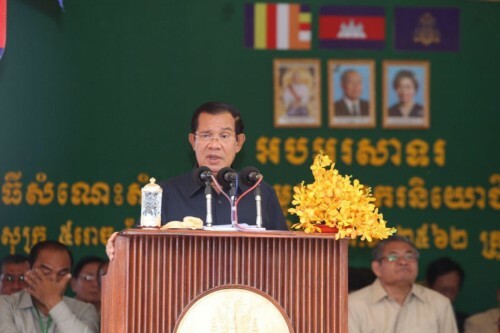 “The documents stating the government planned to reduced ministries to 16 are purely fake,” Premier Hun Sen told Fresh News. “Producing and distributing such documents are the wicked plans of the ill-intended groups who wished to destroy the trust and confidence of the government heads and officials,” he added. It is worth noting that the above-mentioned fake documents were disseminated both on Facebook and Telegram since yesterday following the premier’s meet-and-greet with garment workers in Kampot province late Friday. Prime Minister Hun Sen, in fact, announced to remove some unnecessary offices/departments of ministries at sub-national administration in order to promote work effectiveness and reduce state’s expenses. According to the premier, all the offices will be cut off, except army, police, health, and education, and land management. Indeed, offices of common affairs like agriculture, water resources, rural development will be formed as a collective division. Same goes to industry, mines and energy, and also social affairs and culture.